One of the most controversial and (to this day) talked-about fallouts from an election was the Proposition 8 vote in California, and the protests and dialogue that followed immediately after both against the state and the LDS Church for their role in the election. --- Besides the outrage on both sides and debates that fueled media attention for weeks afterward, it sparked inner discussions between friends and family over LGBT rights and brought to light many LGBT issues within LDS homes. Matthew: I'm a playwright, living and working in New York City, a 2010 graduate of BYU's theater-arts program and a native of Sacramento. Jason: I am Utah boy who spent a significant part of my life living on the East Coast between Washington, D.C.. and then mostly New York. I left Utah to pursue a career in acting, and while I did have success, I found myself becoming more interested in directing and producing. I helped co-found an organization in NYC that I am really proud of, The Innovative Theatre Foundation (also known as the IT Awards), which put a spotlight on the incredible work coming out of the Off-Off-Broadway community. After that got off the ground, I made my way back to Utah to support my family through some difficulty, and while I was here an amazing door opened for me at the Utah Arts Council and I stepped through and now I find myself a Utah boy again. Topher: I'm a 21-year-old music junkie. I'm a junior in the theater program at Utah Valley University, and I work at the Living Planet Aquarium in Sandy. I love my life. I love the '80s, lightning, haunted houses, and octopuses. I want to live in a big city someday. I also want to go on tour with a band. I probably need a band first. Logan: I’m a junior in the Actor Training Program at the University of Utah. I’m 21 years old and have been doing theater since my junior year of high school. 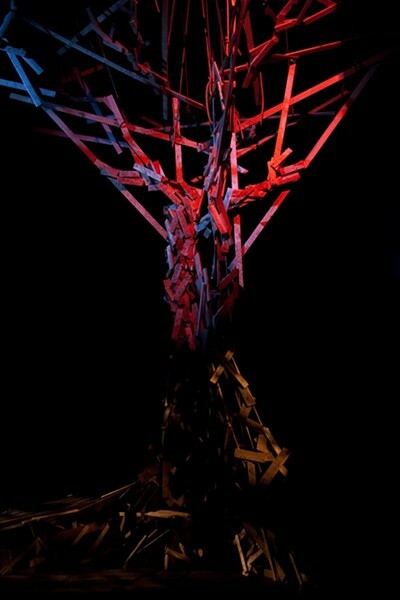 I’m incredibly excited for my first professional production and that it's with Plan-B. Gavin: What have each of you been doing in local theater throughout 2012? Matthew: I haven't been in the area much during the last year. 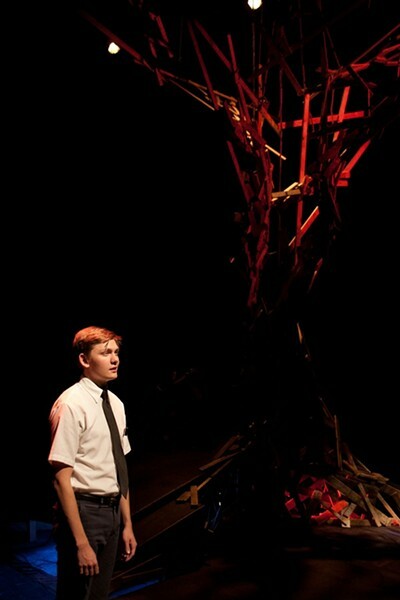 Other than workshopping Adam & Steve with Plan-B over the last year, I had a play at the New York International Fringe Festival last summer called #MormonInChief. 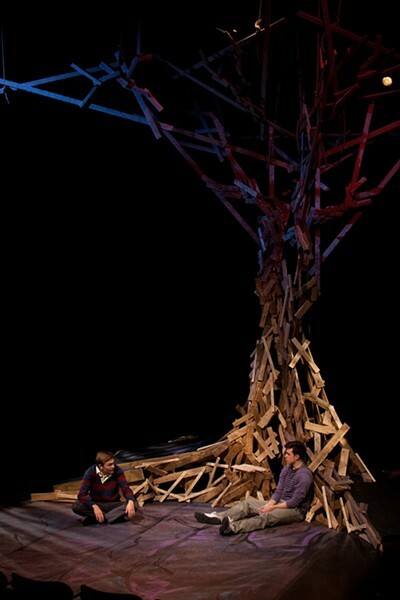 Jason: Mostly, I have been in the seats enjoying the work of my peers. I think there are some great things happening in theater in SLC right now and it is exciting to see. The recent work at the Leonardo from Scott Smith and the opening of the Cube through Utah Arts Alliance both seem to me good omens of work to come. I acted in Plan-B's Script-In-Hand Series reading of 8 in August and since then I have had my focus on Adam & Steve. Topher: Most recently, I was in Plan-B's Script-In-Hand Series reading of 8 with Jason and Logan. And I was in Course 86B In The Catalogue at Salt Lake Acting Company. It was a blast, and I won a City Weekly Staff Pick Arty award for my performance in that show, which was unexpected and awesome. Logan: Throughout 2012, the only things I was in ‘'Tis Pity She's A Whore directed at the University of Utah and Plan-B’s Script-In-Hand Series reading of 8, as well as a staged reading of Adam & Steve with Topher at OUTReach's LGBTQ Youth Summit at Weber State University. 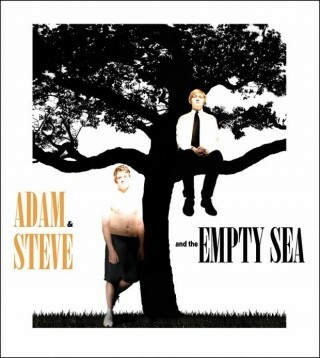 Gavin: Matthew, how did the idea for Adam & Steve And The Empty Sea come about? Matthew: I was at BYU during the Proposition 8 campaign and I was disappointed with the way much of that student body handled the issue. I saw two groups of people who had never voted for a thing in their lives suddenly become hyper-political about this issue and I started to wonder what it was about marriage equality that inspired such unprecedented political involvement on both sides. As I listened more closely, I noticed that both sides were using the same rhetoric of "love and family" and I wondered why two groups of people who seemingly espouse the same ideals have become so diametrically opposed. Slowly, the idea came to tell the story of two people who share a close bond whose friendship is tested by this polarizing issue. Gavin: What was the process of creating the play like for you, and what kind of challenge was it for you keeping a topic like Prop 8 a part of the play without having it dominate it? Matthew: I really wanted the play to be balanced and fair. 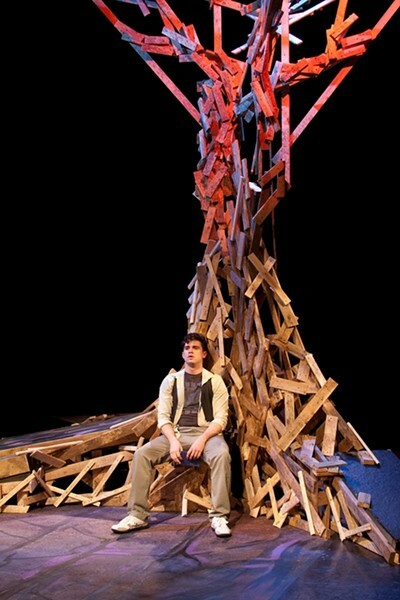 It became obvious to me that both perspectives represented in this play came from a real place and deserve to be heard. All that being said, I didn't want this to become an "issue" play. This particular issue inspired in me an exploration of the transcendent power of love. That is what the play is about because, I think, that is what this issue is about. 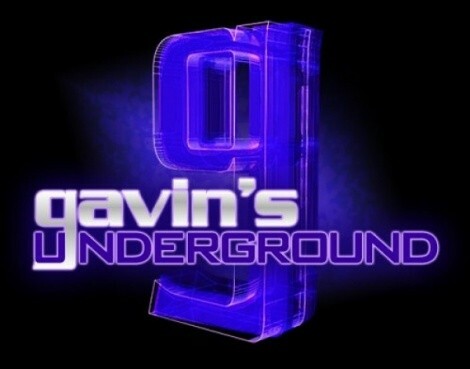 Gavin: What did you think of the initial readings, and how well do you believe it fits into the Plan-B catalog? Matthew: I've been stoked about this production for a while, largely because of the readings and workshopping we've already done. The play has been well-received and the team we have working on the play is enough to get any writer excited. 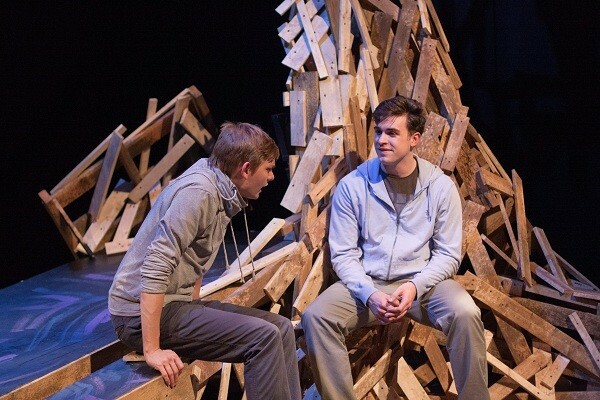 I really admired Plan-B's work while I was at BYU and their efforts to expand the scope of what Utah theater can be. I've always seen the work they do as "important" and I'm just happy to be a part of it now. Gavin: Jason, what were your initial thoughts about the play and what made you want to direct it? Jason: My initial thought was that the play was crafted remarkably well and I was honored that Jerry would put his faith in me. My next thought was honestly about managing my life and work so that I could really give my full focus to directing. All I can say to that is surround yourself with great people and make sure to get their back when they need it. After that small freak out, I spent time in the script and found myself really interested in the ideas that Matthew was exploring and that he channeled all these ideas right down into the hearts of these two boys/men who it is so easy to identify with and love. Gavin: What's been the biggest challenge for you as a director in bringing this play to life? Jason: My biggest aim has been finding the weight of the challenges of the play, fully understanding the cost of the breakdown of this friendship, and then letting that go so that what shines through is the incredible, innocent love these two friends have for one another. Establishing the friendship, understanding the joy of it, creates a great path for difficulty and resolution. 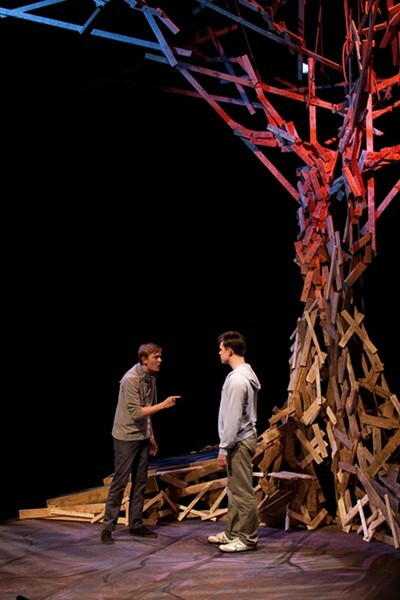 Gavin: Topher and Logan, when did you first find out about the play, and what were your thoughts after reading it? 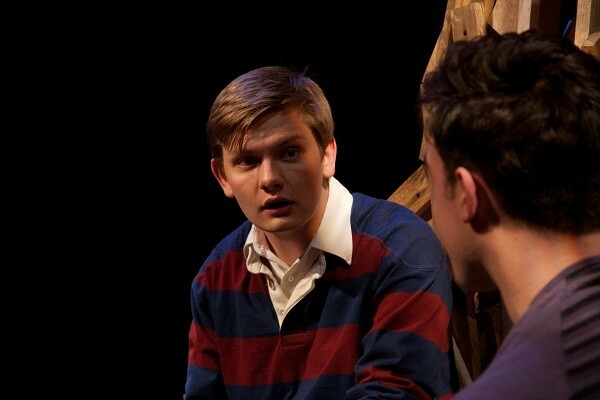 Topher: Well, we did a reading of the play in late 2011, so I've known about it for a while. I loved the rhythm of the piece – it was so relatable. I have grown to love the structure and specificity. 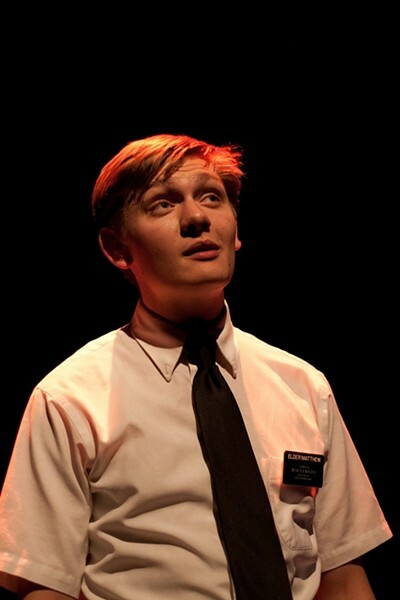 There have been many, many "gay Mormon" plays recently; this topic is very current and there's a lot of drama in the issue itself, with no satisfying answer to the question. This play specifically avoids the clichés of the genre. It's surprising, heartfelt, and refreshingly optimistic, in a weird way. Friendship is about overcoming differences, and this play really makes that point without being sappy or lame. Logan: I found out about the play simply because my friend Christian -- who's in the ATP with me -- told me I’d be “perfect” for a part in this new play that was going to be directed by Jerry Rapier. I read the play and really enjoyed how natural the dialogue seemed to flow and I really fell in love with Steve’s character, which was awesome since that was the only role being auditioned for at the time. I loved how strong Steve is, as well as the friendship dynamics that are shared between him and Adam. I remember being scared that the play was going to be stereotypical before I read it, but after reading it felt strongly otherwise. Topher: I was trying to figure out how to answer this question without sounding pretentious or smug, but a little while after the reading Jerry asked me to do in 2011, he offered me the role. It kind of makes sense; I am very, very familiar with the situations Adam gets into. I was raised Mormon, and have struggled with that. So, Adam and I are very much alike. Logan: I was very lucky that Christian auditioned with me. He and I read through the sides together after both reading the play. We got to try many different ways of approaching the scenes while also almost getting off book, which was an added bonus. The only things I remember about auditioning were thinking Topher was awesome, and that I probably failed for Jerry. I was especially self-conscious about the kid scenes, thinking that I didn’t really use the set or my body well enough. However, Jerry asked about my upcoming summer schedule and he got my contact info, and by the end of that day, I got a call from him offering me the role. Surprised and ecstatic, I gladly accepted. Topher: Adam is a role that I haven't had to do a lot of research for because I've lived through a lot of the things Adam goes through. That said, playing a character with a strong testimony of the church sometimes feels weird. I dunno. Logan is great; we have a similar sense of humor, which really helps us have a believable lifelong friendship through the play. He and I get along very well. I think Logan's a little more cerebral, a little more logical than I am. Which is great, and it really works with the dynamic of the characters in the piece. Logan: I have loved the process of fitting into my character, and I think that’s partly because he’s really like me in so many ways. He’s a jock, he has had a pretty good high school social life, he’s a good student and he’s not LDS; all traits that I share or have experienced throughout my high school days. The only main difference is his sexual orientation since I’m straight myself. The fact that one of my best friends from high school is gay, and I have close friends and family relations today who are in the LGBT community, helps me with my character. The other difference is that Steve doesn’t have strong involvement and support with his family, whereas my family has always been incredibly supportive and I consider my two sisters to be my close friends. Interacting with Topher has been really interesting. I’m typically more on the shy side of things, so each day spent with Topher has been less and less difficult to connect to him in and out of rehearsal. It’s kind of awesome because Topher and I really have a lot of things in common. He’s definitely taken me under his wing too as far as helping me out with the ins and outs of Plan-B. He’s always dedicated in each scene, hilarious, talented, and surprises me. Gavin: Seeing how it's just the two of you, does it present more of a challenge that you have to play off each other more without an ensemble of characters, or do you find it easier with the two-man back and forth? Topher: It's both harder and easier than other shows. On the one hand, it's a lot of responsibility; I mean, we have all the lines and it's practically all dialogue, very few monologues. The entire show is on our shoulders. But on the other hand, we get to live the entire arc of the play together, with no one getting in the way of us connecting and communicating. It's hard to explain. But, of course, I love having a large role, haha. Logan and I have a very nice rhythm, which is important to me as an actor. Logan: I surprisingly find this process a little easier than being in an ensemble show. I think it’s a privilege to have the necessity in a two-person show to never be allowed to “sit and watch” until certain cues spark a character’s response, which should never happen, but seems to be more common in ensemble work. But there is never a time where that is possible in this show. This has taught me the importance of constantly listening. I was intimidated by the number of lines I would have to memorize, and that if at any point one of us loses focus it’s up to us to keep the show moving. But I have been amazed at how quick these lines have grown into me, and I think it’s the fact that almost every line is a response to what Topher is giving me and those actions and intentions stick with me better than any other memorization technique. Gavin: Considering the subject matter of the play, how close to home does this hit for all of you personally, and how has it affected your views on Prop 8 and LGBT rights in America? 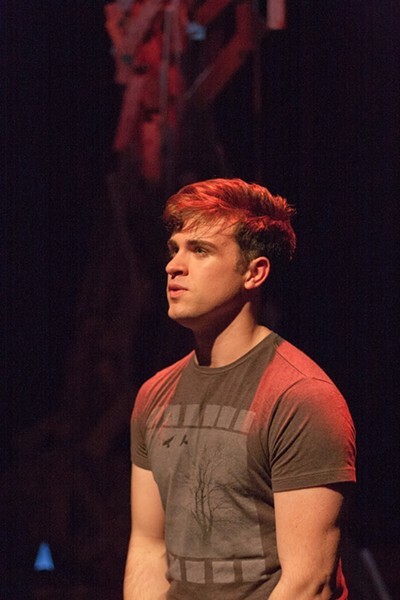 Matthew: This play is certainly the most personal thing I've written, and the time I've spent writing it did so much to open my eyes to the significance of this point in history, especially for LGBT rights. Maybe it's because I'm young, but I've never known an America where civil public discourse happens. I've heard that in days gone by people actually listened to each other, but I've never known that world. Adam has a line near the end of the play where he offers simply to shut up and listen to what Steve has to say. I think that is the biggest lesson I've learned through this process: the simple notion of opening up an honest dialogue. As I've done that, my mind has opened up exponentially to better understand this and other difficult issues. Jason: It hits pretty damned close to home for me – at 17, I was a devout Mormon who came out of the closet. My family was, and is, really incredible and I knew that I wanted both things in my life. My mother really practiced unconditional love. That does not mean that we did not have some very painful conversations with each other trying to find common ground, but it did mean that there was no question we would ultimately find common ground. Ignorance equals fear is a slogan I grew up with during the AIDS crisis and I think the message is just as important today. Categorizing and painting large strokes in understanding "others" will never allow us to find the places of conversation where something good can grow. 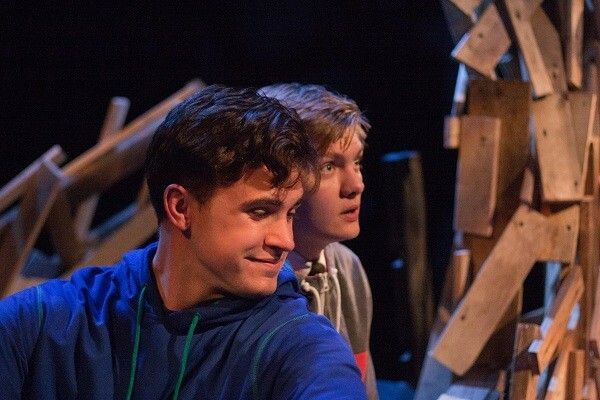 What Matthew does so well in this play is that he has these boys, who have developed their roots with each other's support, grow into men with strong opposing convictions who choose to step into their own unique place of existence with one another in honor of the love they share. Topher: My entire extended family is actively Mormon, and very close. Many of my friends at school are Mormon. My best friend is Mormon. I probably know more Mormon than non-Mormon people. Which I just realized is kind of insane. The opinion of the church, the official statements on homosexuality, play a large role in how most of my community treats -- or at least thinks -- about LGBT individuals. Personally, I am not satisfied with the answers I have been given about homosexuality from the church/church members, and that is a big reason why I don't identify as a member of the LDS faith. I am very much in support of equality, and I think Prop 8 was a disgusting time in the history of the LDS church. This play hits very close to home, having to play an ignorant teenager who believes what he is told to about these issues, who is on the side of the ban. It breaks my heart that a lot of my friends believe that way, who don't believe that gay marriage should be legal. I hope the message this play has -- of tolerance, of love -- will have an effect on some of the people who come to see it. 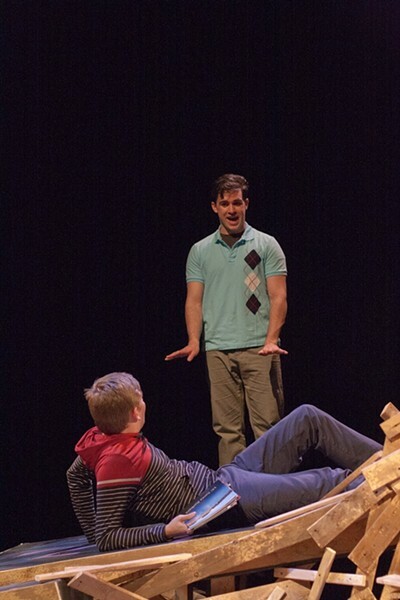 Logan: This play has helped me see things in a more personal way than my straight-guy’s perspective. My mom raised me to be supportive of the gay community, and one of my late uncles on my dad’s side named Patrick was gay, who from my memory was one of my favorite uncles. I’ve had friends who are gay throughout high school and much more openly so in my college years. It’s never been important to me who these people are attracted to; it’s just been about their character. This show has actually given me a chance to feel the fear that could go through the mind and heart of someone struggling to keep friendships and purpose in a world that constantly says they’re wrong when coming out. It’s given me a greater perception on just how much these humans have to go through to love. This whole process with Plan-B has given me a greater understanding of Prop 8. This process has simply helped me learn much more about gay rights, and the human aspect has been the most prevalent. I feel a small sense of excitement for the continuing support, awareness and understanding that has been happening in the past few decades, and I hope this play can be part of that continuation. I’m excited to see where our country ends up, and I believe our nation will soon adopt the LGBT community as simply another part of what makes up our country, not a group alienated from it. Gavin: What do you hope audiences will take from this play, and how do you believe the LGBT crowd will react? Matthew: I hope audiences will reflect, as I have done, on the transcendent power of love in overcoming even the most divisive of issues. We should never sacrifice relationships with people we love on the altar of our lofty ideals because, I believe, that love is the loftiest of those ideals. I don't know that the reaction from the LGBT community will be any different than it is for anyone else in the audience. My hope is that this is a human story that will resonate with all people, regardless of their differences. Jason: I hope that people really love both characters and that they let go of any prejudices and hear each of the points of view represented. I don't want the audience to let their personal conviction go. I just hope they can really understand the emotional journey of each character. As a gay man myself, I have a lot of anger surrounding Prop 8 and I find my emotions piqued by certain arguments from each character. I can only imagine that others in the LGBTQ community will feel similarly. Ultimately, though, I find deep satisfaction that love breaks through those arguments, leading these two characters into a deeper level of friendship. I hope others have a similar ride with this play. Topher: I hope people take away a feeling of love and an understanding that deep friendship is a bond that can't be broken so simply by religious confusion or politics. Or at least it shouldn't be. I hope people leave feeling optimistic about the future; that's how I feel at the end of the play -- that I don't know how things will work out, but they will somehow, and as long as I open my heart to love and try to love myself, to love others, that everything will turn out alright. Logan: I hope the audiences will learn what is important to them regarding friendship and personal beliefs. This show doesn’t give just one side of this story involving LGBT rights. It also helps people see where the LDS character is coming from, as well. Both of the characters are people. Both of them love each other deeply as a best friend. This show lets the characters talk, be themselves however they feel is the most natural and nourishing, and finds out which is more important: having the other person join in their point of view, or at least listening to and respecting the other person’s point of view. I hope audiences of all backgrounds may use this template of love and friendship to see past what opposing beliefs people have, and worrying about their character instead. I don’t want to speak for the LGBT community, but I’m pretty sure they’ll enjoy it. Matthew: More than anything, I'm excited. It's so nice to be working with a cast and crew I feel like I can trust going into opening night. The audience is the final collaborator in the creative process so I'm eager to see what the end result will be. But, really, I think it's going to be a great show. Jason: My mind is buzzing! This is where all the pieces start coming together like a puzzle and it is exciting and nerve-wracking. I can't wait for audiences to come and take this journey and for them to see the exceptional work of these two fine actors. Topher: I am so excited for my friends and family to see this show. I am so excited to have conversations about it. I am so excited to celebrate this piece with Matthew Greene and everyone. I just hope we do the best that we can, and that people will relate to us. Logan: WHEW! It’s going by so fast. I’m sad it’s almost over already, and I want to make sure each performance counts. That’s not to say I want to make sure it counts for the audience, but I want to stay true to our rehearsal process and the work we have done so far. The audience will think whatever they may, but I want them to respect the show the Plan-B cast and crew have created. That’s not to say I’m not a little nervous to get up in front of all these people and remember the lines for this two-person show. Regardless, I’m excited and so grateful for the time I’ve spent on this show; it’ll be bittersweet when it’s all over. Matthew: I'm currently working on a short film and another play. There is also a film adaptation of Adam & Steve that will, hopefully, be starting production this year. 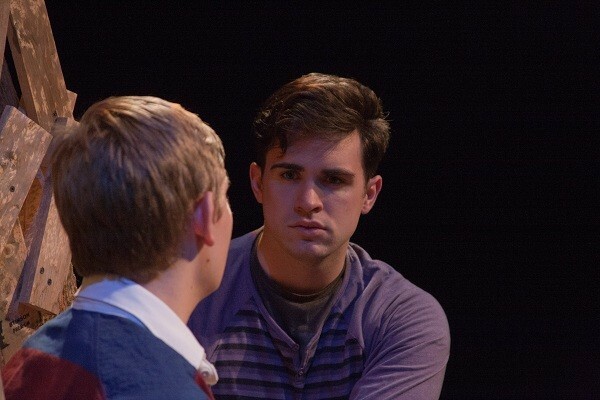 Jason: After this, I go into rehearsal at the University of Utah for Reason To Be Pretty by Neil LaBute. I have a great cast and am already in production meetings, which can, at times, also get my head spinning. Topher: I'm looking forward to the Script-In-Hand Series reading of Eric Samuelsen's translation of Ibsen's Ghosts this August at Plan-B. Also, hopefully, more music. Logan: Over the rest of 2013 ... well, you can definitely stop by the U of U and I should, hopefully, be working on a play or two over there. I’d love to continue working with Plan-B on anything else they could extend my way. I want to continue auditioning all around and see what the year could bring me, but I will most likely be busy working on my degree. Matthew: Mostly just the obvious. I hope people come out and enjoy the play! Jason: In my daytime life, I work for the Utah Division of Arts and Museums and I have recently booked the Keynote Speaker for the upcoming Mountain West Arts Conference on Thursday, May 2. The Keynote will be Cherie Buckner-Webb, who is a Senator in the Idaho Legislature. I was lucky to hear an address from her in October and she blew me away. She told this beautiful story of art being this touchstone in her life, something she could always return to in times of sorrow and joy ... and then she began to sing and she has this incredible jazz-soul voice and it gave an immediacy to her message that had me riveted. Topher: Grassroots Shakespeare Company does amazing work. Logan: I love my family and I don’t know where I’d be without Jordan, Devon, Mom and Guy. My friends have been amazing, especially my roommates, TJ and Brooks. I’m thankful for my training and peers in the Actor Training Program at the U. Everyone at Plan-B has been a privilege to meet and work with, and they have made this process special and incredibly fun.